Reflections from the ‘Towards an Autonomy of Housing’ event that took place on the 22nd of February 2017 and was presented by the UCL Development Planning Unit (DPU) as part of the series DPU Dialogues in Development. Industrialisation, a well-known driver for rural to urban migration, creates the increased demand for housing as a by-product of a swelling city. Emerging cities in developing nations, lacking the capacity to respond to a rapidly increasing urban population tend to become inundated with the enormous demand for housing, which poses a problem with no immediate solution. A housing deficit left unaddressed gives rise to the development of informal settlements by people perceived to be left with limited options. In an effort to find their own solutions, settlers “illegally” create unplanned neighbourhoods in areas not fit for development and deficient of infrastructure and services. In the case of Lima, rural migrants who rushed to the city for employment and enterprise found themselves in overcrowded and shabby ‘tugurios’. In the 1950’s, individuals frustrated with forking out huge portions of their income for high-cost rent in exchange for sub-standard living conditions formed community groups to plan major land invasions in the hills surrounding the centre of Lima. The strong networks formed by the invaders made it difficult for authorities to action any form of evictions against them. The invasions took place around the same time that John F. C. Turner, a British architect who had been closely examining housing policy and programs in Lima, wrote his ﬁrst report in 1959. The government of Peru tried and successfully relocated some squatters to government land. However, the invaders of El Ermitaño stood their ground forcing authorities to develop strategies to take into account their needs through slum-upgrading, rather than to resist the young settlement. Turner, despite this, critiqued the implementation of these processes in his early career, finding them to be insubstantial in addressing the dwelling needs of the communities they were to service. 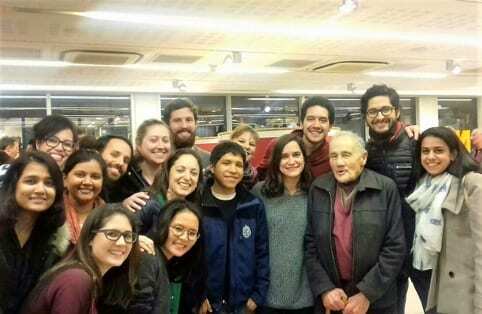 The residents of El Ermitaño, with the help of Turner’s advocacy, were granted legal tenure and were able to avoid evictions and demand municipal services. Dr. Katherin Golda-Pongratz, a German architect who followed Turner’s work closely while completing her PhD in Architecture in Peru, became interested in and is now referencing Turner’s contribution to El Ermitaño in her own work. 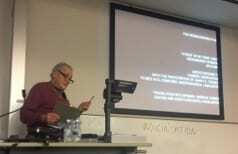 She gave an anecdote about how the two have collaborated on the Spanish publication of the book Autoconstrucción which explores Turner’s 1948 writing. The book references Patrick Geddes’ pattern of relationships in the “notation of life” which has influenced much of Turner’s philosophy. The book will feature other articles written by John and translated in to Spanish including an entry for the magazine Architecture and Design that was the precursor to the film A Roof of My Own. Golda-Pongratz further explained how the research process of completing Autoconstrucción led to the resurfacing of the 30 minute documentary guest-edited by Turner in 1963 and released the following year by the United Nations Centre for Building and Planning. The version originally released to the public aired void of an integral address from then President Fernando Belaúnde. A Roof of My Own takes the viewer into the arena of the autonomy of housing in the 1960’s. It highlights the political, social and personal discourses of the time in the settlement of El Ermitaño in northern Lima and demonstrates how ordinary people were managers of their own house construction. 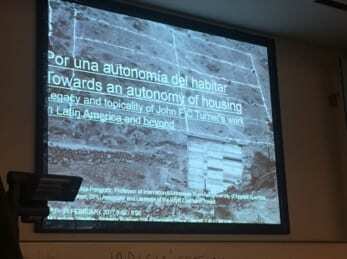 The case of El Ermitaño underscores Turner’s concept that informal settlements are not to be viewed as a problem but an opportunity to provide solutions to the problem of housing. In his introduction of the video, Turner touched on the relevance of the film in today’s housing climate where young professionals worldwide find themselves not earning enough to save for a downpayment on a home. They are instead forced to stay at home with their parents or are caught in a vicious cycle of settling in expensive, sub-standard housing which consumes most of their income, hindering their capacity to save. He also stated that housing policies that aim to provide homes that the poor cannot access is not a suitable to rectify a housing deficit. A Roof of My Own has inspired Golda-Pongratz to continue the legacy of Turner’s work by creating a sequel to the film. She hopes to show her continuation in the same community centre in El Ermitaño where the original film was screened by the invaders. El Ermitaño is now considered an ‘arrival city’ where Golda-Pongratz anticipates that the second chapter will provide a link to the new generation of residents. The narrative will explore the precarious living conditions of families living on the lomas, increasing the pressure and encroaching on the fragile landscapes. The trailer for the new film asked probing questions relating to the ‘limits to growth’, the role of land traffickers in urban expansion as well as the role of the residents in place-making and shaping the future of the El Ermitaño. Monique Rose is an Architect and Chevening scholar from Jamaica studying for a MSc in Environment and Sustainable Development. Her research interests are in housing and disaster risk management in the Global South. This year she has joined the UrbanArk Project team and will write her dissertation on the relationship between urban planning and disaster.